These orange daylilies are just beautiful. I painted this one in watercolor from the live plants that bloom in my garden. 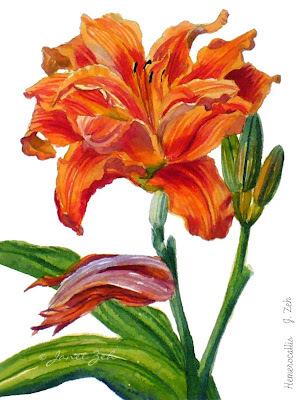 Orange Daylily Botanical print is available in multiple sizes and may be ordered framed, unframed or on canvas. Click the Order Print button below for sizes, options and prices. Botanical Painting Demonstration - see how this daylily flower painting was created.